One of my suppliers sent me some sequin fabric applique hearts so I just had to try them out. They are so easy to sew onto a top. I am loving the sequin hearts I just had to order some hearts and circle for stock on the website. You could hand sew them on if you wish. I pulled out my machine to sew them on using a straight stitch. I set my machine to the widest stitch so you don’t lose the stretch in your fabric. 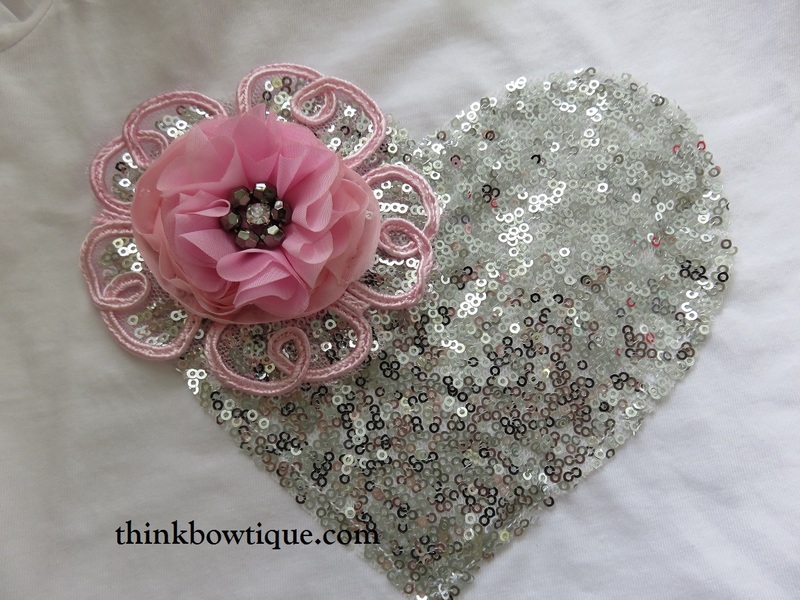 Place you sequin heart fabric applique in the position you wish to attach it. Then pin the the top layer of the top only. I placed my pins in the middle so I don’t have to move them while sewing. I took the front of my machine off you could leave it on if you wish. Feed you top so the top is ready to sew and the bottom is under the arm out of the way. I started sewing at the point of my heart and bottom of the top. Place the foot about 5mm from the edge of my sequin heart. I set my speed to low do a backsticdid a few stitches then stopped put the needle down the lifted the foot. Just to make sure the sequins did not get caught on the foot. As you make your way around you heart and up towards the top of the top you will need to lift your fabric from the top out of the way. I just turned it up and rolled out of the way. 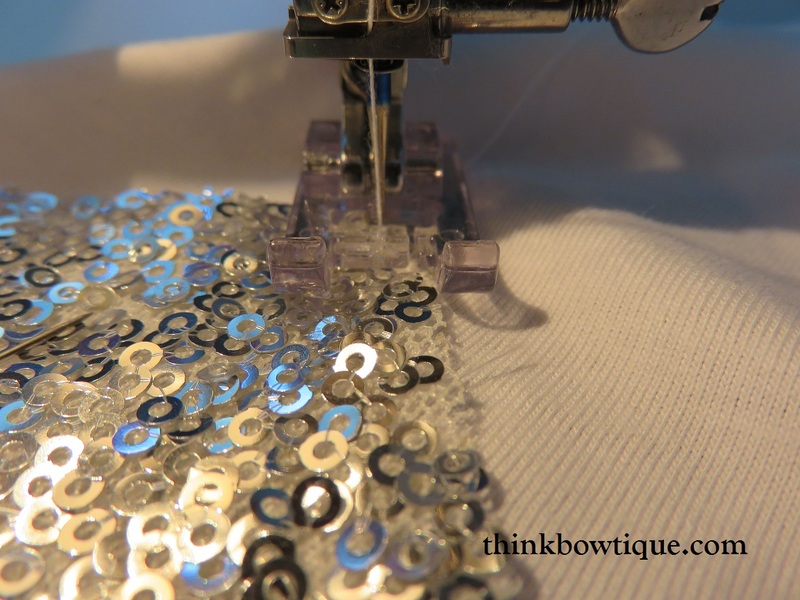 Once you have sewn all the way around the sequin heart you can do a small backstitch and trim your threads. I felt the first attempt at sewing this sequin applique heart come a little puffy,so I have unpicked the stitching and had another attempt. This time I very gently pulled on the heart and pinned. Don’t stretch it just pull it a little and pin. Don’t pull on the top just the heart. This one I forgot to shorten my stitches it still stitched nicely however I do prefer the wider stitch. You can wear the sequin heart as is or embellish it with fabric flower or sequin applique flowers or anything your heart desires. I choose to use our sequin applique flower with one embroidered motif flower with a 20mm pearl and rhinestone embellishment. You could you our pretty chiffon peony flower blossoms or any of the many fabric flowers we stock. Shop Think Bowtique for a huge range of grosgrain and satin ribbons, fabric flowers, elastic’s, embellishments, tulle and more here in Australia.